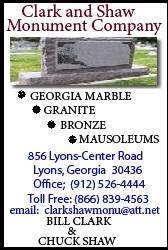 March 12-- Graveside services for Mr. Leonard Earl Thompson will be held Thursday, March 14, 2019 at 2 PM in Washington Memorial Gardens in Sandersville, GA. Reverend Bobby Williford will officiate. Mr. Thompson died Tuesday morning, March 12, 2019 at the Georgia War Veterans Home in Milledgeville, GA.
Mr. Thompson, 86, was the son of the late Annis C. & Ruby Dell Sweat Thompson. He was a lifelong resident of Tennille, a high school graduate and was the longtime owner of Thompson TV in Sandersville. He was a United States Army Veteran serving during the Korean Conflict and a member of Josey Baptist Church in Bartow. He was preceded in death by his wife, Elnora Crook Thompson; son, Larry Thompson; granddaughter, Rachel Thompson and grandson, Wade Thompson. Survivors include his wife, Sandra Lindsey Thompson; son, Tony (Doris) Thompson of Ivey; three daughters, Lynda (Freddie) Graham of Vidalia, Debra (Wayne) Brown of Leesburg and Camron Thompson of Tennille; brother, Gary (Charlene) Thompson of Commerce and a host of grandchildren, great grandchildren, great great grandchildren and other relatives. Higgs Funeral Home (higgsfuneralhomeandflorist.com) of Soperton has charge of arrangements.